What is Heterostructure Design Studio? Heterostructure Design Studio is state-of-the-art quantum simulation CAD system developed for semiconductor heterostructure engineering. The Heterostructure Design Studio performs calculations of energy levels' positions, corresponding wave functions and dispersion of confinement states in semiconductor heterostructures, dipole moments, momentum matrix elements, optical gain and optical absorption. Full range of optoelectronic simulations - from layer design to optical gain. Very detailed options for each step of simulations. Flexibility in specifying parameters. See Key features and benefits. Broad range of heterostructure materials - use of any binary, ternary and quaternary alloy of A3B5 material with zinc-blend crystal structure as layer and substrate material: GaAs/AlAs, InAs/AlSb/GaSb, InGaAs/AlAsSb/InP and other heterostructures. Fast and precise calculations - finite-difference self-consistent multi-band kp approach for solution of Schrödinger equation. Use of LAPACK library for eigenvalue problem solution. User friendly interface - intuitive and easy to use interface, project saving, control of each step of simulations, data viewing and export. Trusted results - the Heterostructure Design Studio produces results in a good agreement with experiments and theoretical results in referred papers. 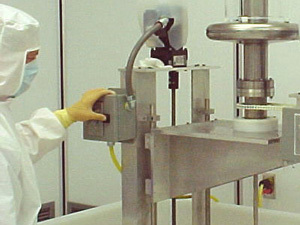 The Heterostructure Design Studio has been tested and is in use in Research Centers and Universities. Design of optoelectronics devices requires costly preparation of samples to get desired properties. 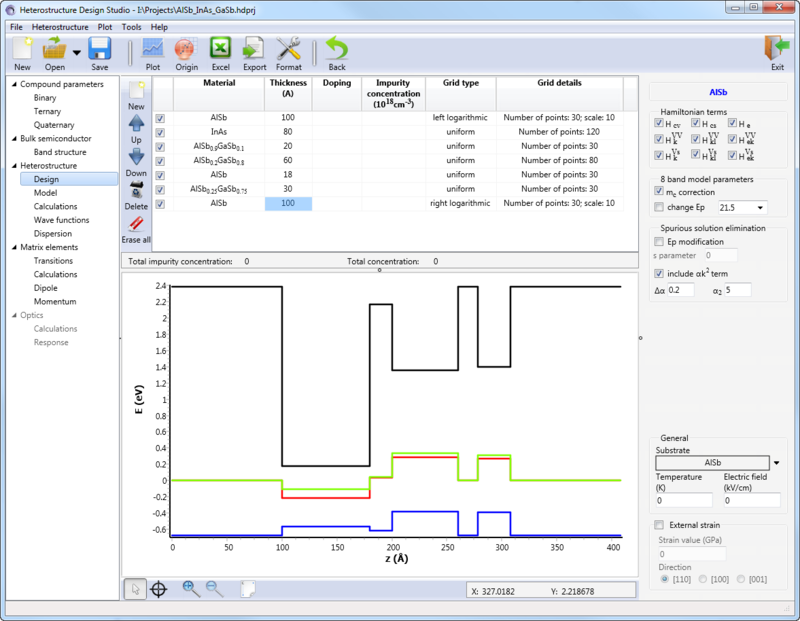 The Heterostructure Design Studio allows predicting device properties by doing simulation. The calculations of wave functions, momentum matrix elements, optical gain etc with different input parameters of heterostructure provides the necessary information about device properties and its behavior under different external conditions that decreases the device design time and costs. Engineers involving in designing of semiconductor heterostructure devices will find the Heterostructure Design Studio an extremely helpful tool. The Heterostructure Design Studio provides scientists with precise and accurate calculations during all steps of heterostructure simulation. Knowledge of bandstructure calculated according to precise model and optical properties allows to work not only with novel structures but also to find hidden features properties in already known structures. Both scientists doing theoretical and experimental research will find the Heterostructure Design Studio an indispensable tool for their work. Semiconductor heterostructures are subjects of study at quantum mechanics university courses. The base of courses is the theory of band structure and wave functions. Due to extremely complicated formulas, which include eigenvalue and eigenfunction problem of differential equations' system, it is impossible to get a result in analytical expressions. The Heterostructure Design Studio can be a working tool in solving exercises for the chapters in textbooks related to theory of heterostructures. Use of Heterostructure Design Studio provides students with both deep understanding of theory and practice in heterostructure calculations.